Make sure to read the Broadcast Setup QuickStart article first! This is the official Broadcastify.com Live Audio suggested method to connecting your radio and computer for a reliable and good quality audio feed. There may be other connection methods but some of them do not work reliably and may deliver poor results over time. These instructions assume that the radio has a mono 1/8’ mini connector for the line or headphone output and the computer has a standard sound card with stereo 1/8’ mini connectors. Best audio from the scanner to the computer is via a line or record output and with this use of correct cable types. The radio will most likely have a mono 1/8” mini jack for either line (Record) out or headphone out. Some think that you can use a stereo cable connected to these mono outputs on the radio and all will be OK. The truth is, this is not always correct. This may work on some systems and not other systems. Or it may work for a while and fail. Not all mono or stereo jacks are created the same. There can be differences between manufactures that can cause a working situation to stop working over time. There is a difference in a mono connection and a stereo connect. The best set up there for is to keep the mono side mono and the stereo side stereo and use correct mono to stereo cables or adaptors as needed. This will help avoid the following audio related problems: no audio, poor audio, distorted and dropping audio etc. A streaming device that can stream in Icecast (Win, Mac or Linux computer, Barix Instreamer, Raspberry Pi etc). Windows and Linux computers can run more than one feed on the same computer. Alternative Broadcasting Software and Clients. See same section for Mac, Linux and other streaming software and devices. If using Windows or Linux computer, you need a USB or internal sound card for each feed. 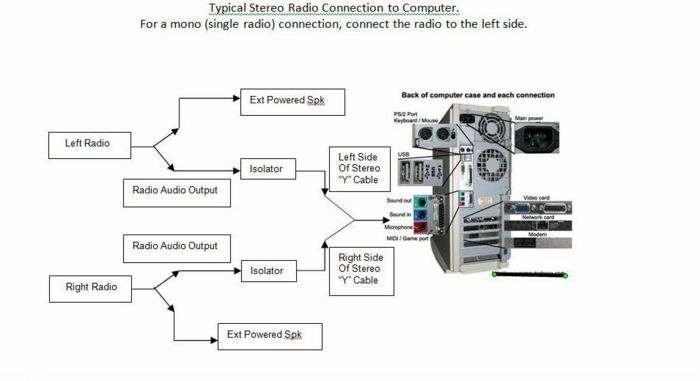 A one radio mono or two radio stereo feed on a computer needs one sound card. If your are streaming several feeds from a computer, each feed needs a separate sound card. One radio or scanner for a mono feed. This would be a single radio feed. Two radios or scanners for a stereo feed. One for the left side and one for the right side. This would be two radio feed. Each feed needs a separate BCFY feed application. If running more than one feed on a Windows computer, you can run several instances of ScannerCast or RadioFeed, one for each feed. For ScannerCast, just put the .ini file name, what you would like to call it, example “scanner1.ini” in the command line as pictured. When you start ScannerCast with this line in there it will create the .ini (configuration file). Put the added file name in the command line of a shortcut icon. For RadioFeed, just download & install for each feed, Sorry, but you can only run one instance of NiceCast on a Mac so you are limited to one feed on a Mac. See here: Multiple Feed Configuration. To set up a streaming scanner audio feed on the Internet you must pay attention to a number of things, but once these are done properly you can sit back and enjoy, along with all your adoring listeners. Buy the proper audio and data cables to go between your scanner radio and your streaming audio computer. Program your scanner to allow audio to flow to the Rec or Tape Out jack, if available. Connect all the cables and adapters. Configure your streaming audio software. Set the audio levels properly for the best sounding feed possible. You will need the following cables. These can be purchased from various sites on the Internet or you can usually find them in stock at your local Radio Shack store, but check their web site for availability first. • Plug the 1/8 mono mini connector of cable “A” into the radio audio output (line/record or headphone output). • Plug the 1/8 stereo mini connector of cable “B” into the computer audio line or mic input. • Connect one side of cable “A” to the White side of cable “B” and the red is not used. • If using the line or record output of the radio, Cable “A” will not have anything connected to the other side. • If using headphone output, plug an externally powered speaker in to the other side of cable “A” so you can listen to the scanner. Set the scanner level control to feed to computer and use the external speaker amp volume to adjust your listening level as needed. • Determine whether the computer sound card input is Mic or line in. Best is line in but Mic in will do, just watch the levels. If using RR Branded ScannerCast, the streaming parameters are pre set. • If you use the audio isolator, (see #Related Links) insert it between both Cables “A” and Cable “B”, observing the correct left/right markings. If you have connected your scanner and computer as suggested in above, all you will need the following cable. • Connect one side of cable “A” to the Red side of cable “B”. It is highly desirable to send the channel tags from your scanner along with the audio stream so that listeners know what they are hearing. If your scanner provides a serial data interface and you use the proper software on your streaming computer, you can add this channel tag data and greatly improve your feed. For the Uniden BCD996T scanners you can use the cable that came with the scanner to connect from the mini-USB connector on the front of the scanner to the DB-9 on your computer, or you can use a traditional DB-9F to DB-9F cable from the rear of the scanner. The BC780XLT has a DB-9F on its rear apron, so you will need a cable with a DB-9M on one end to connect to the scanner and a DB-9F on the other end to connect to the computer. If your computer has only USB ports, you can buy an inexpensive converter that provides a DB-9M connector for older serial cables. Install the driver software provided with the converter and select a COM port that is compatible with your streaming software. Then configure the streaming software for the same COM port that connects to the scanner. ScannerCast can talk directly to the BCD996T scanners. Talkgroup Monitor can talk to both BCD996T and BC780XLT scanners, but is more complex to set up. Ideally you should use the streaming computer's Line Input since this more closely matches the audio level from your scanner. Make sure that the boost check box is cleared since you do not want to amplify the strong audio from the scanner any more than it already is! NEVER exceed 0dB level on your stream or it will sound distorted and awful, so people will not want to listen to it. Red-lining is no good at all for digital audio. Measure the audio level from your scanner(s) by opening any sound processing software on your computer that has an audio meter display, such as SoundForge, Total Recorder, Audacity, or simply use the excellent Audio Level Meter PC software that displays the sound card input levels on screen. To set the proper audio level for your scanner stream, set your scanner to the local NOAA weather radio broadcast since they provide continuous transmissions. If they have particularly quiet audio or can not be received at your location, go to a conventional radio channel in the scanner and open the squelch to receive white noise. If you were forced to use the scanner's Headphone jack, adjust the scanner's volume control to between 1/4 (one-quarter) to 1/2 (one-half) volume level, no higher. You don't want to overload your sound card and potentially blow it up! Note the position of the volume knob in case it gets bumped in the future; you can make a mark on both the knob and the scanner housing to reset it quickly. Using the scanner's Line Out eliminates all this mess. Now that you have some audio coming from your scanner, adjust the Recording mixer control associated with your scanner input until the audio level meters peak around -3dB or so, NEVER let the peak indications hover around 0dB or your feed will sound crappy and nobody will listen to it. Most of the audio peaks should pop up to -3dB or -2dB on occasion, while the rest of the audio signal should fall significantly lower than this. Set your scanner to scan its normal scan list and listen to your stream under actual program conditions to ensure that you have configured it properly. Don't hesitate to tweak it to perfection, as nothing about this is plug-and-play! Just make sure never to exceed 0dB and you should do fine. If your stream has two scanners, then repeat the process for the second scanner and give it a test listen. If you are certain that your hardware connections are correct and you don't get any indication of audio, go to your software mixer controls in the Recording settings to ensure that you have selected the input control matching the hardware input where the scanner is plugged in. If you plugged the scanner into the Line In, then the mixer must have a check box ticked in the Line In column. Other packages such as SimpleCast, ProScan, Windows Media Encoder, and others should use the following settings for best results. Configure the streaming software to use the correct sound card input. This is especially important if you have multiple streams running from one computer with multiple sound cards. The typical radio output will be an 1/8 inch mono jack. Always use the Line Out, Record Out, or Tape Out when available on the scanner. This provides a constant audio level to the streaming computer and allows you to listen to the scanner's local speaker whenever you wish. Failing that, use the Headphone jack, not the speaker output. You can monitor your scanner via the streaming computer's speakers. The typical computer sound card input will be an 1/8 inch stereo jack. The Line Input is desirable and is usually color-coded blue. Some computers, particularly laptops, only provide a Mic Input and this is usually color coded red. Line output of the radio to line input on the computer is the best connection as this gives the cleanest audio and still allows you to listen to the scanner on its local speaker. Once you set the audio level, you don't have to touch it again since the volume control does not affect the line output. Uniden scanners must be programmed properly so that each channel is set to Record = ON to allow audio to flow to the Rec or Tape Out jack. If you skip this step, the feed will not get audio from the scanner on those channels. Newer Uniden scanners label the line output “Rec” (for Record out) and is located on the rear of the radio and is color coded green. The Record output needs to be turned ON via the software to activate it for use. If you need to connect the headphone output of the radio to Mic in on the computer you will need to watch your audio levels on both the radio and computer. It is very easy to overdrive the audio. Avoid using the speaker output of the radio because the output level maybe too high for the computer input and cause distortion. If this is all you have, keep the volume level low, between 1/4 to 1/2 volume. The use of an audio isolator can help to eliminate hum between radio and computer due to different a.c. power grounds. Radio Shack has an isolator listed in #Related Links. It is an audio transformer that blocks d.c. continuity between the scanner housing and the computer case. Monitor the desired frequencies to ensure that the scanner does not receive radio interference from computers and computerized equipment nearby. If necessary, move the scanner around or re-orient the power, audio, and data cables to avoid picking up stray radio energy from devices in your shack. You'd be surprised how dirty some devices are.